Damon Martin, Royal Dano, Phil Fondacaro et al. DVD: 84 min., Blu-ray: 89 min. 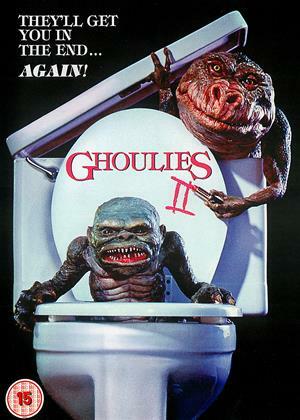 The Ghoulies are back and more devilish than ever, as they turn an unsuspecting carnival into a house of pandemonium in this wildly outrageous sequel to the original smash hit to "Ghoulies"! "Satan's Den" has received its final warning; either the not-so-creepy House of Horrors spooks-up its act and scares some customers fast or its gateway to hell will be closed for eternity. Just when Larry Prentice (Damon Martin) and his uncle Ned (Royal Dano) think there's not a ghost of a chance that they'll save their show, they get some uninvited visitors to spice things up. The Ghoulies make "Satan's Den" their home and profits soar as the demonic little creatures wreak havoc on the helpless fairground.